According to Wikipedia, the sunchoke is often mistaken for a sunflower, because its stalk looks like a massive sunflower that is missing its flower. It grows just as tall as a sunflower and produces tubers that grow underground. The vegetable is starchy, like a potato, but a little sweeter and nuttier in flavour. 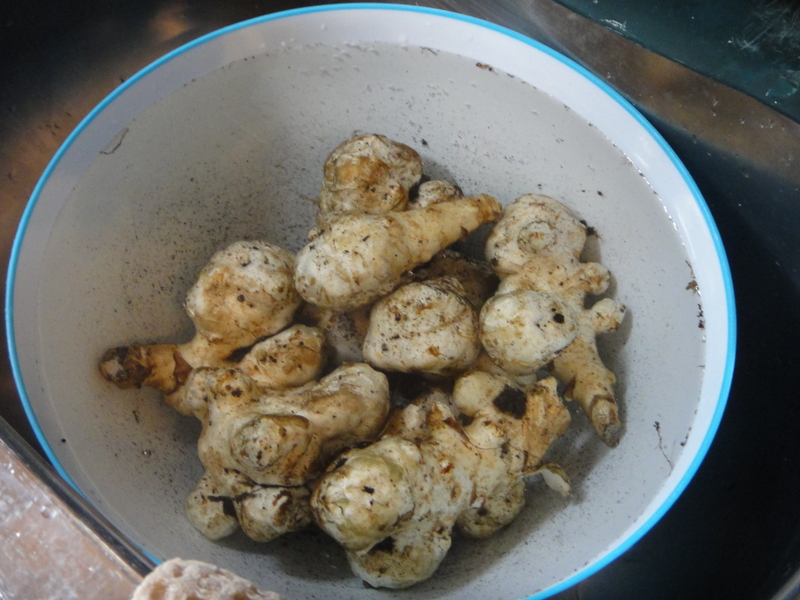 This root veggie is great to eat raw in salads, or roasted, boiled or steamed. This sounded like a soup veggie, to me! 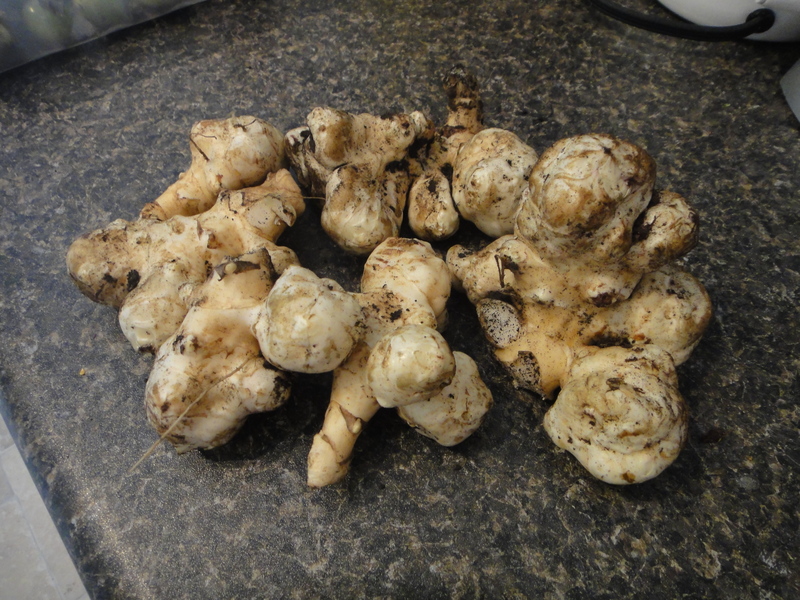 Here’s what the sunchoke looks like. It kind of looks like raw, fresh ginger, doesn’t it? In order to get all of the dirt out of its little knobs, I read that it’s easier to soak them before brushing them clean. It worked like a charm. They came out nice and shiny clean. 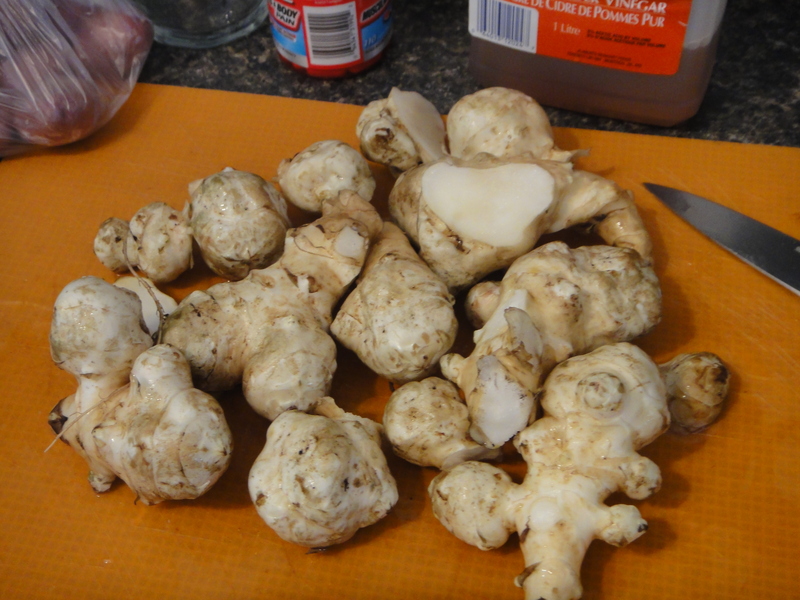 Next, I chopped the sunchokes into little bite-sized morsels. 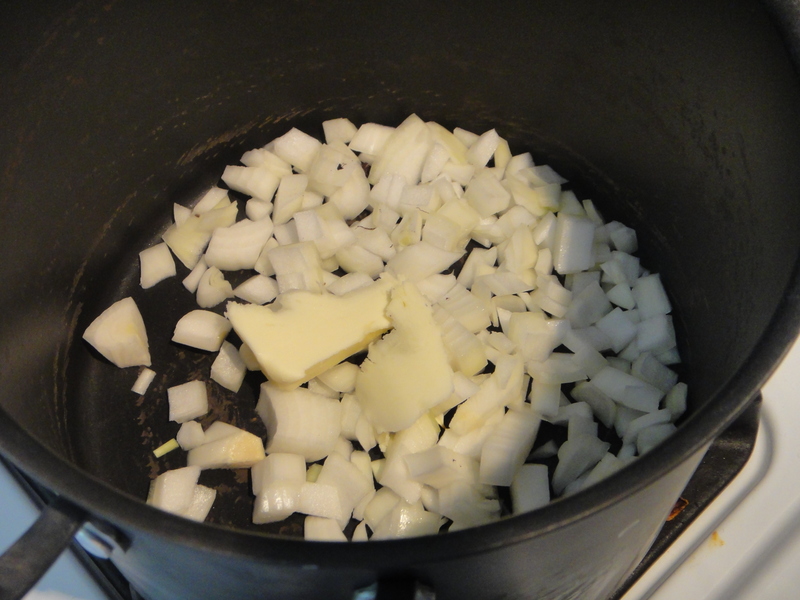 For the soup, first things first was to brown some onions and garlic with butter in a pot. Once the onions were cooked, it was time to throw in the potatoes and sunchokes. Cover the whole thing with stock, and bring to a boil. Let it all boil and bubble away for 30 – 45 mins, or until the veggies start to fall apart. Adjust your seasoning, and voila! Tasty, creamy soup! In a large pot, melt butter and cook down onions and garlic until brown. Next, add sunchokes and potatoes. Cover with stock and bring to a rolling boil for 45 mins, until veggies begin to fall apart. Once cooked, blend soup in a blender, or use an immersion blender to puree the soup and to get rid of all the lumps. Serve with a sprinkle of cracked pepper on top. Enjoy!